Beneath a cluster of cypress trees deep in the mystical bayous of Louisiana lies the home of an alligator named Swampmaster Bejeaux. Cajun hunters are fixing to have a fais do-do, and they’re swarming the swamp in search of some gator to add to their big pots of jambalaya and andouille gumbo. Swampmaster Bejeaux figures it’s high time that he high tail out of there, so he sets off in search of “somewheres dat I can git me some peace an’ quiet.” Along the way he meets several of his swamp friends who help save his hide as he encounters hunting camps, some black magic, and even the feared loup-garou. 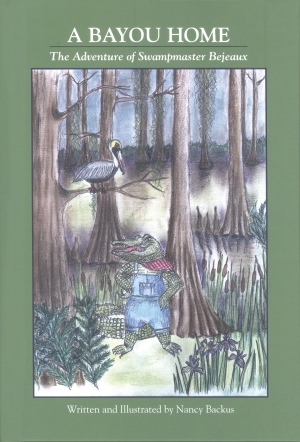 Accompanied by detailed illustrations, this middle reader is a raucous romp through Cajun country! Retired school teacher Nancy Backus taught grammar, writing, and literature in the New Orleans area for many years. Originally from Kentucky, she has spent her adult life soaking up the history of New Orleans and the surrounding area. She particularly enjoys all things Cajun. Roniger received a BA degree from Newcomb College of Tulane University and a Master of Arts in English Teaching from the University of New Orleans.